The 1950s was THE golden age of Chicago blues according to many blues scholars and fans. I count myself as one of the many lovers of the classic Chicago sound, and cherish any new recordings by the few remaining musicians from that era. 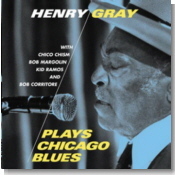 Pianist Henry Gray is among the best of the Chicago veterans still on the blues scene, and this new album, Plays Chicago Blues, captures the rawness and raucousness of the music from that period. Phoenix-based producer and harmonica player Bob Corritore assembled a solid supporting cast for the sessions represented on Plays Chicago Blues, including drummer Chico Chism, who was also a part of the Chicago scene during the same period as when Gray was active there, and former Muddy Waters guitarist Bob Margolin. Rounding out the backing band are Fabulous Thunderbirds guitarist Kid Ramos and a trio of Phoenix's top blues players in Johnny Rapp (guitar), Paul Thomas (bass), and Pops McFarlane (bass). The disc starts strongly with a rambunctious original. "Talkin' 'Bout You." that puts the listener into the mood for a good time ... no sign of any depressing blues here. If there's any question as to whether Gray's piano playing has lost any nimbleness or agility through age, he puts that fear to rest with the frenetic instrumental "Henry's Houserocker." Aided by the superb drumming of Chism, this number recalls the wild and "almost out of control" instrumental romps of Gray's former employer, Howlin' Wolf. The blues doesn't get any bluer than on the slow number "Trouble Blues," with incredible Muddy-style slide playing from Margolin, who makes his guitar sing along with Gray's pained vocals. The spirit of Wolf is recalled again on the uptempo shuffle "How Many More Years," with Corritore's harp riffs dancing playfully around Gray's raspy vocals and his pounding piano accompaniment. Without taking the limelight away from the star of the show, Corritore makes this album a personal statement for his tasty harmonica playing, especially the fuller, heavily amplified sound on the Gray original "How Could You Do It." Ramos lends his guitar talents to the slow blues "It Hurts Me Too," providing more sophisticated licks to contrast Gray's most impassioned singing on the album. Rapp comes to the front of the bandstand on the midtempo shuffle "Don't Start That Stuff" with a beautiful solo in the middle of the song. The album closes with one of the better numbers, a serious Chicago blues original, "Showers of Rain." Gray's co-stars, Corritore and Margolin, each are given the opportunity to show their best stuff here, and they take full advantage with excellent solos and accompaniment. Margolin has long been regarded as one of the most faithful evangelists of classic Chicago blues, and his sympathetic accompaniment on this album shows why he has earned that reputation. After listening to Plays Chicago Blues, you'll feel like you've been transported to the windy, inhospitable streets of Chicago. But that's what happens when you assemble a living legend with a band of guys who love to play this kind of music, even if you do so in a studio in Arizona, and not in Chicago. The result is the best collection of Henry Gray recordings in many years.